Your nose knows: There are hundreds of odors in nature that tell us when something is wrong. The interesting science behind this is that there are only a few groups of compounds that are the cause of all these odors, including petroleum products (like gasoline and diesel), sulfides (like rotten eggs and skunk), ammonia (like urine) and aldehydes (like formaldehyde, a known carcinogen).The enzymes in PureAyre cleave the bonds of the molecules that make up these odor-causing compounds. And PureAyre is the only product that contains all the enzymes needed in a high enough concentration to do the job. As a result, PureAyre literally cleans the air and permanently gets rid of the source of odors leaving you with pure air. PureAyre is both strong and safe because it’s made from natural ingredients. And it’s the natural ingredients that make it such a powerful odor eliminator. Advanced biotechnology has made it possible to bring together just the right plant-derived enzymes in just the right combination to specifically target and break down all five groups of odor-causing compoundsfound in nature. As a result, PureAyre permanently eliminates odors, even persistent odors like cat urine and cigarette smoke. So I HAD to try this product! 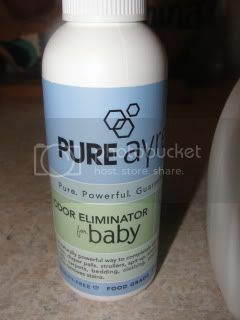 I was super excited to have the opportunity to review the PureAyre Odor Eliminator for Baby. I was so excited when it arrived! 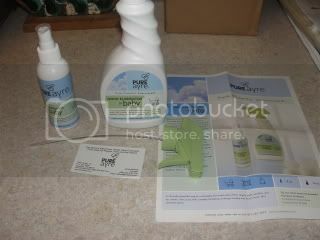 I received the 14oz and 4oz bottle of PureAyre. We had a stinky diaper pail ready and waiting to be sprayed! 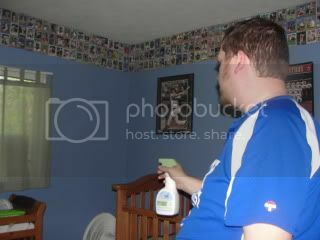 My son’s room is one of the hardest rooms to keep odor free. With the diaper station and diaper pail it is a never ending battle. 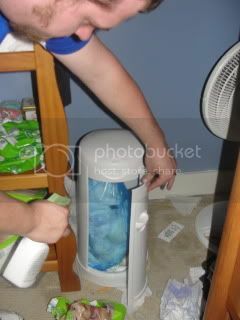 Seems like no mater how often we clean and dump the pail I can smell “that smell”. You know that “diaper smell” ? Yes that is the one. I asked him and my daughter what it smelled like. After several minutes of trying to describe it we realized it does not have a strong odor like most. In fact it only smells like CLEAN AIR! It smells fresh and clean! I LOVE IT! And you know what? After 20 minutes it STILL smelled good! And After 45 minutes it STILL smelled clean! I was shocked! PureArye really worked! I also LOVE that it is SAFE for my kids to breath. If it gets on my children’s toys be accident it is ok! PureArye is made from plant-derived enzymes making it safe to breathe! 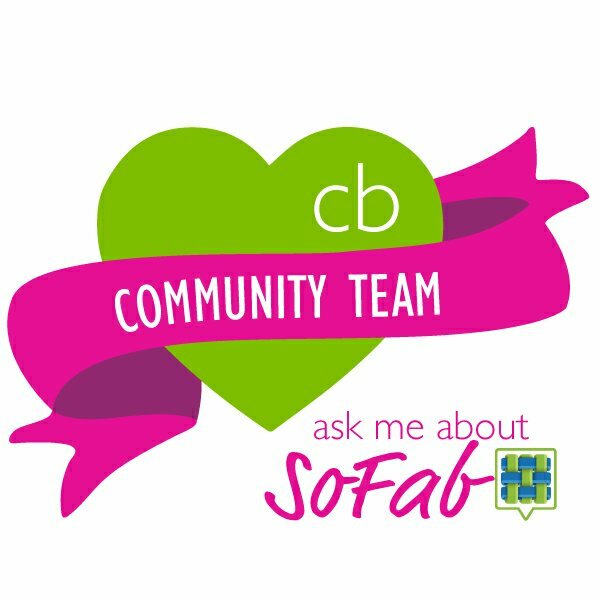 It is safe for my kids and my home! We now use PureArye everywhere! You can use in your home, car, boat, on pet odors and on baby odors. Whatever your problem, PureArye is your ODOR ANSWER! Look no further! Here is your answer! 1 – 4oz Baby PureAyre, Travel Size$24.99, includes shipping! There are many other choices to choose from. Visit the PureArye shop now to check out all the options. Follow the PureArye for all the latest on Twitter and Facebook. PureArye has generously offered to give 1 Living on Love and Cents reader a 4oz and 14 oz bottle of PureArye. Tell me what you NEED PureArye to help you with (certain room, pets, cigarettes, diapers, car, etc)! See the Give Every Night New Flavor Widget on the right? Click on it and tell me what your favorite recipe is? Leave 3 comments for 3 extra entries!! See the Gotta Love Chevy Houston Ad on the sidebar? Click on it and Like GLCH Facebook (saying hello from Living on Love and Cents would be GREAT) Leave 3 comments for 3 extra entries!!! Disclosure: I received these items from PureArye for the purpose of the is review. No monetary compensation was received for my review. All opinions are 100% mine.